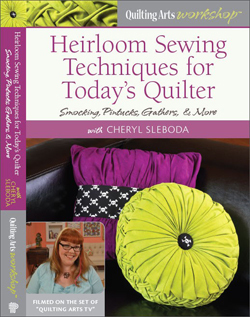 Weekly Quilts in 2010 – Cheryl Sleboda – Textiles. Technology. Texture. Teacher. I will be doing weekly quilts in 2010, however, I have opted to do something a bit different (again) this year. The last two years took themes and expanded them out over the 4 weeks of a month (sometimes 5). This worked great in some instances, and less so in others. The hard part was the travelling for work. It was hard to take some of these themes “mobile”. Sometimes the themes left me uninspired after I got the original idea out of my head. Some would have worked better as a larger piece, so I left detail out that I would have preferred to have tried. One of the things I liked about the first year of weeklies is that they were often technique based. The whole reason I did some of those pieces was to work with a new material or try a technique out. So I have decided to go back that way, and use the weekly pieces as an educational exercise. I have two other concepts I’d like to incorporate somehow this year, either in monthly works or something to that effect. First, like 2008 was the “Year of the Pomegranate”, 2010 is the year of the “cephalopod”. I am not joking that I have seen squid and octopuses EVERYWHERE. They are a dominant theme lately, and I think it’s kinda cool. So that’s one concept. The second is that I am voracious researcher. I love to learn something new, and the things I learn are so very eclectic that there has to be some theme that can be taken away from the learning. So, expect to see works in new techniques, often with themes based on something new I have learned recently or cephalopods.. ha ha! Happy 2010!